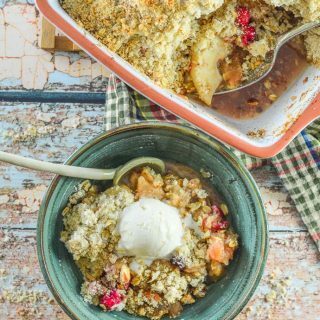 It’s hard to beat a good crumble, and this Cranberry Apple Pear Vegan Crumble is really something special! We’re talking tart cranberries & Granny Smith apples, sweet, soft pear & a crumbly, nutty, buttery topping, all baked to golden perfection. It’s an absolute crowd pleaser & so easy to make! Who’s up for dessert? If you’re anything like me then you are always up for dessert and I’ve got a real crowd pleaser for you today! 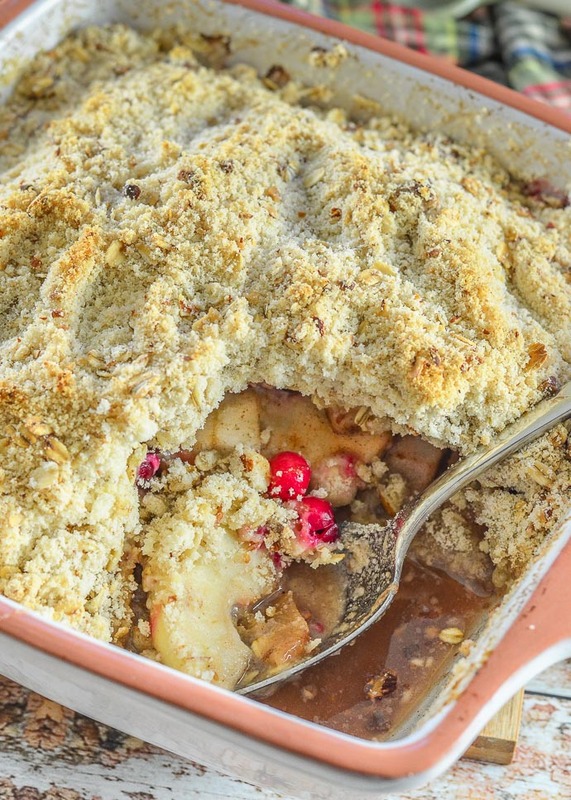 This my friends is a Cranberry Apple Pear Vegan Crumble and it is just perfect for dessert over the holidays. In fact, I’ve included it in my Vegan Christmas Dinner Menu, Shopping List and Timeline because it’s so yum. If you want your Vegan Christmas Dinner planned down tot he tiniest detail fro you, then go check it out. Now to the crumble…We are talking Granny Smith apples, because they keep their shape nicely and give a little bite rather than turning to mush, sweet pear that dissolves into a delicious puree, bursts of tart cranberry and a light, crumbly buttery golden topping studded with chewy oats and crunchy almonds. Feel free to ditch the almonds if you need to make it nut-free though, it’s still amazing without. Paul (a.k.a Mr A Virtual Vegan) has been away for a couple of weeks so he has missed out on taste-testing this beauty, but apple-y desserts are his favourite so I think this might just make an appearance on Christmas Day, along with the multitude of Vegan Christmas Puddings that I have in storage after testing that recipe more times than I care to remember. 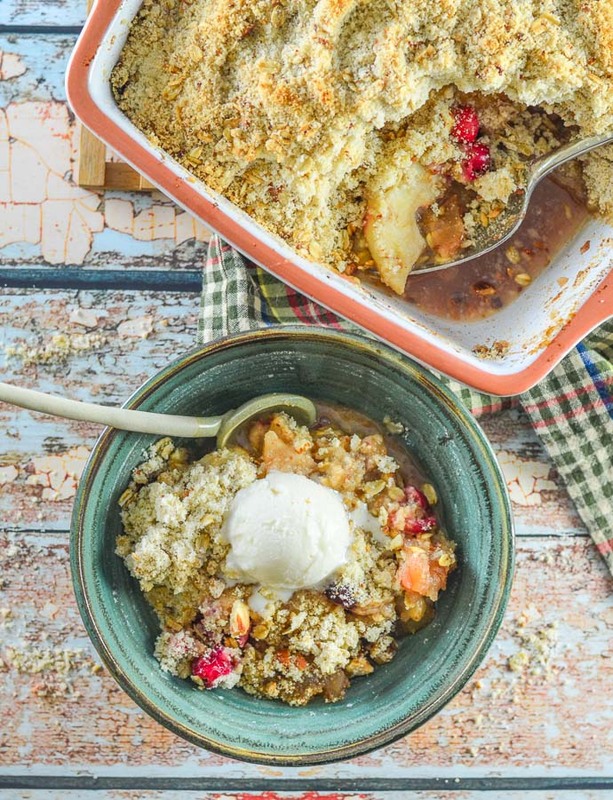 There are just a few simple steps to making this crumble. First make the crumble topping. 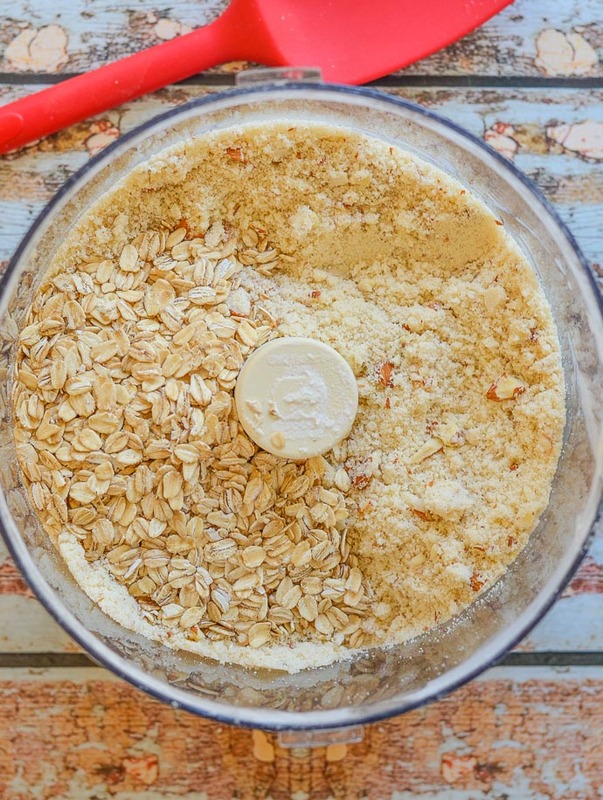 Put the flour, vegan butter, sugar, salt and almonds in a food processor. I have this food processor and love it but if you don’t have one don’t worry, I give instructions for doing it by hand below too. Pulse until the flour is looking bread-crumby and the almonds are in chunky little pieces. Then remove the blade, add the oats and stir through. At this stage I really recommend freezing the crumble topping. All it needs is 30 minutes, although it can stay in there for weeks in a sealed container or a freezer bag if you want to make it ahead of time. While that’s in the freezer, peel and chunkily chop your fruit and put it into a large bowl. 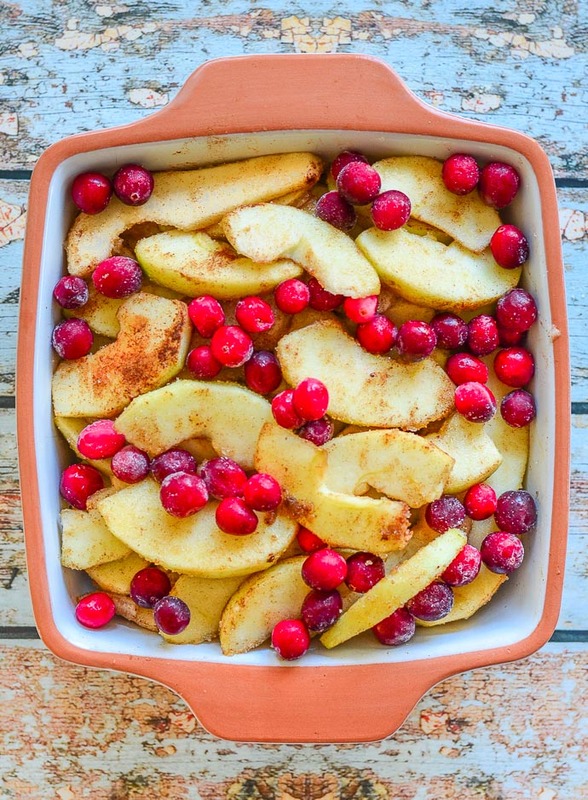 Toss with vanilla, cinnamon, sugar and a tiny bit of flour then pour it into the casserole you are going to bake it in and scatter over a few cranberries. Then remove the crumble topping from the freezer and spoon it evenly over the fruit. Bake until golden, enjoying the wafty, festively spiced smells as they drift through your house! Freezing the crumble before baking slows the melting of the butter and improves the texture. There isn’t a massive difference, and by all means, if you don’t have time, just bake it right away. But, even if you can stash it away in the freezer while you peel and chop the fruit it will make a slight difference. It makes the topping lighter and more crumbly, and causes the powdery mixture, to become a little more clumpy and nubbly, adding a more interesting mouth-feel and look. CAN I MAKE FRUIT CRUMBLE IN ADVANCE? This Cranberry Apple Pear Vegan Crumble is really easy to make, and although I don’t recommend making the whole thing in advance, because the apples and pears will probably go brown and the crumble topping might get soggy, you can still make things easier for yourself by making the crumble topping as far ahead as you want to and keeping it in a sealed bag or container in the freezer. Then on the day you want it, it won’t take long to put together at all. My favourite ways to eat it are with So Delicious Vanilla ice cream or custard! 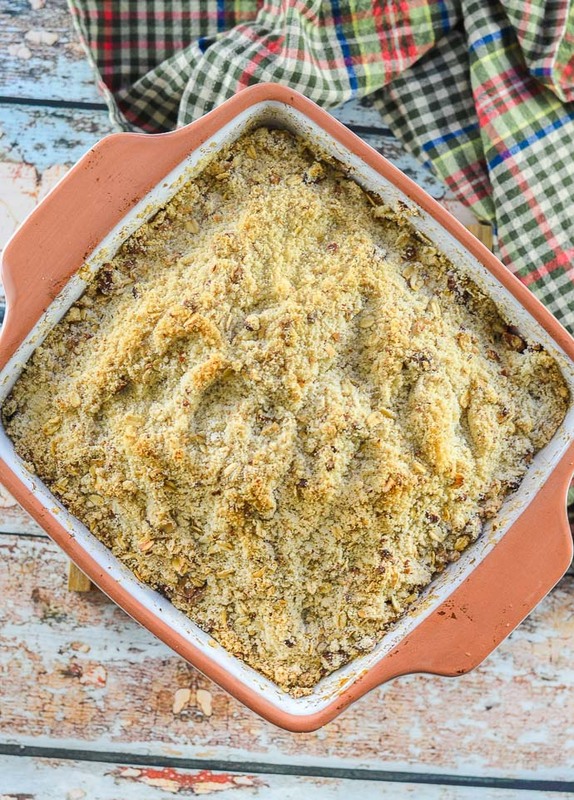 If you are cooking for family or friends over the holidays, consider giving this Crumble a try. I can guarantee that it will go down really well! 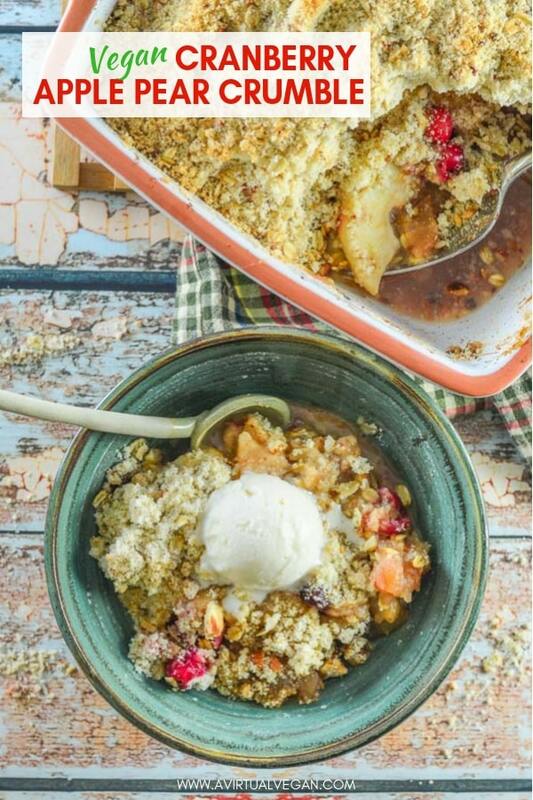 It's hard to beat a good crumble, and this Cranberry Apple Pear Crumble is really something special! We're talking tart cranberries & Granny Smith apples, sweet, soft pear & a crumbly, nutty, buttery topping, all baked to golden perfection. It's an absolute crowd pleaser & so easy to make! 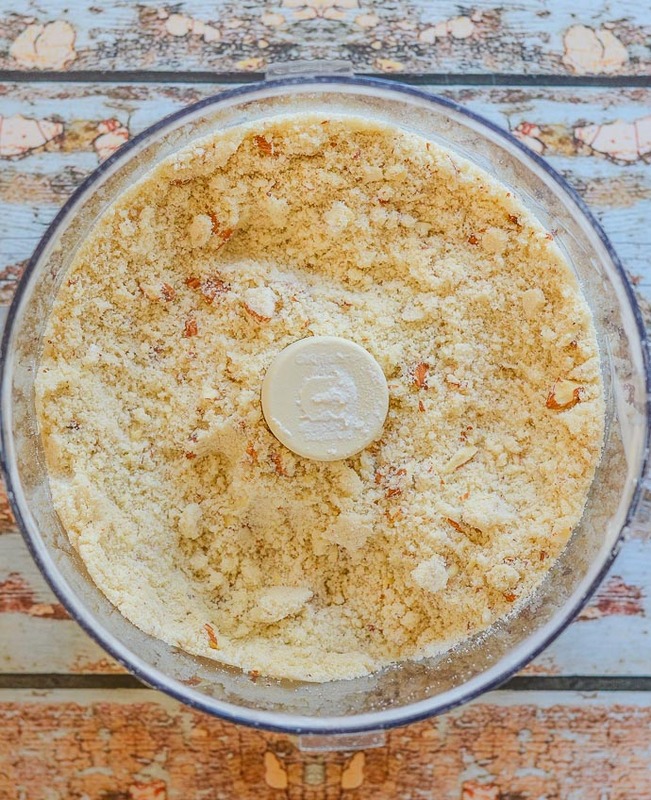 Put all of the crumble topping ingredients, except the oats, into a food processor and pulse until the flour looks like coarse breadcrumbs and the almonds are in chunky pieces. 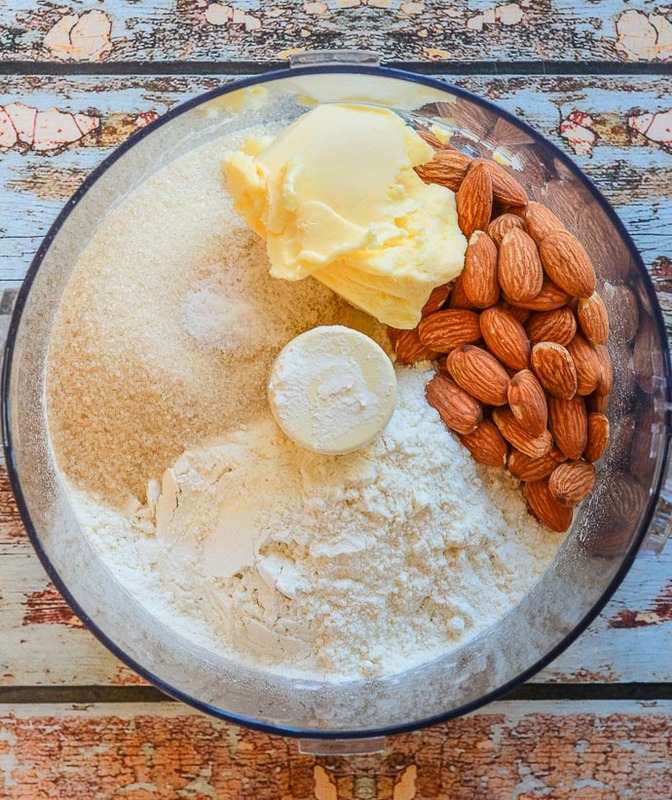 If you don't have a food processor you can rub the butter into the flour, sugar and salt with your finger tips then chop the almonds into small chunky pieces then combine the two. Mix the oats into the crumble topping and then for best results place it in the freezer for 30 mins. There is no need to cover it if it's only for 30 minutes but if it's going to be in there longer be sure to have it in a sealed container or freezer bag. You don't have to freeze it. It's perfectly good if you don't, but better if you do. 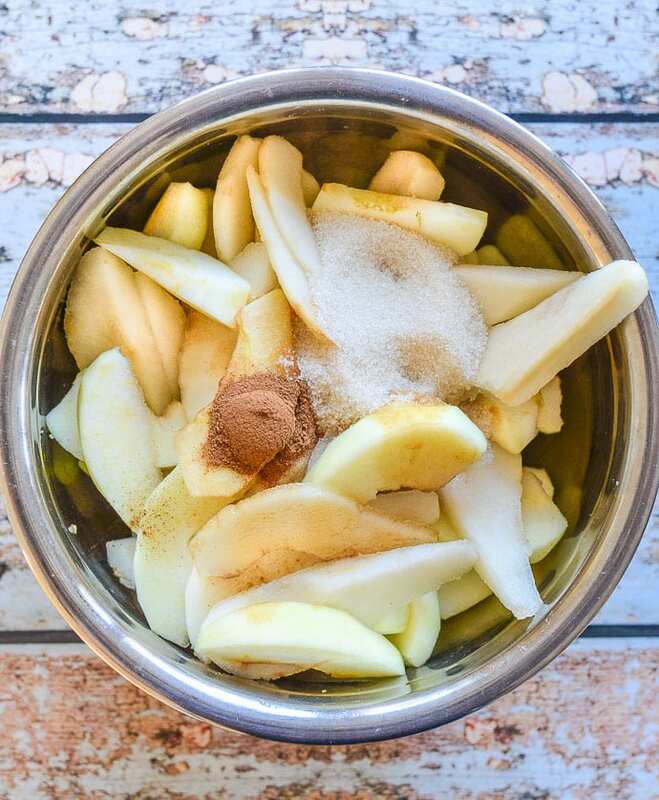 Pour the apple mixture into a baking dish (I used a 9 x 9, 3 inch deep dish and it was a really tight squeeze but I got it all in. Don't use anything smaller than this. Flatten them out evenly then sprinkle over the cranberries and pour over the water. Take the topping out of the freezer and spoon evenly over the top. It's best for goldenness and texture not to flatten it out. Just leave it rustic looking! Leftovers will keep in the fridge for 4 - 5 days and reheat well. 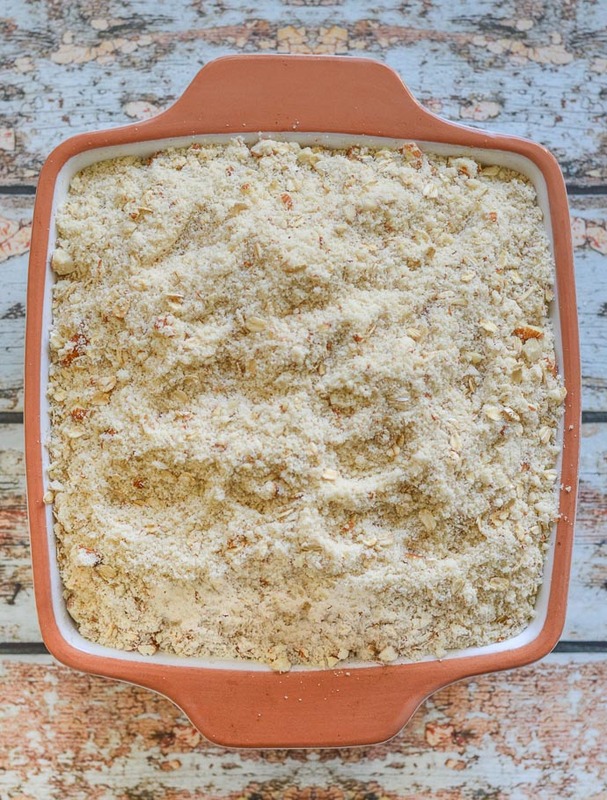 Crumble topping can be made many weeks ahead and stored in a sealed container or freezer bag in the freezer. Well this recipe has Christmas written all over it Melanie! 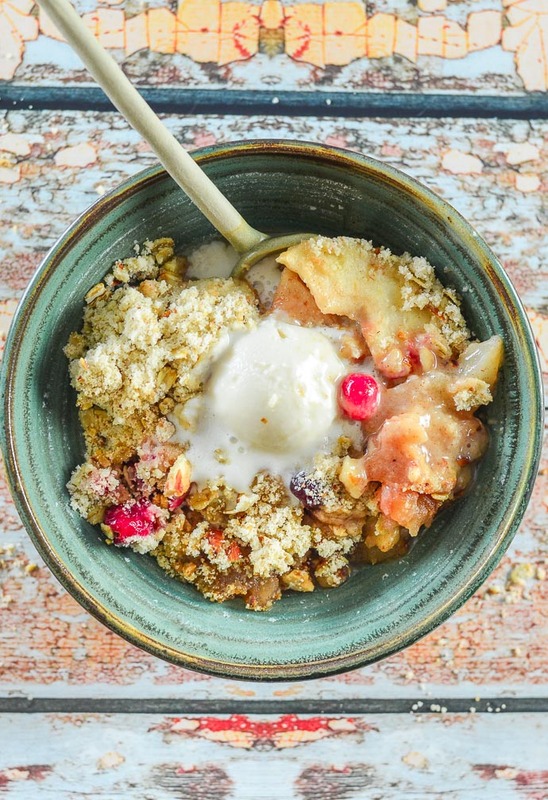 I love crumble and your festive twist makes it a great treat over the holiday season! Ohhh, I do love a good crumble! This one sounds so festive and warming! So pretty and delicious! Such a unique combination with the tart cranberries and Granny Smiths! We loved it. Mmm Mel this looks so comforting! Cranberries are so good for you, and I love finding awesome ways to incorporate them into my diet! I love crumbles!! This looks delish and I love the step-by-step pictures. Thanks for sharing! Thank you. I really wanted to make a video but didn’t have time so step by step pictures it is instead! Thanks for posting this recipe. I’m going to try making it this weekend! p.s. I think it’s hilarious that your suggestions for serving it includes dairy… lol. Best wishes. I assume you are referring to me listing vanilla ice cream as a good accompaniment? There are many vegan vanilla ice creams readily available at grocery stores these days. Just under the list of accompaniments you will see that I link to my favourite ice cream which is made by So Delicious and has a cashew milk base. I don’t feel the need to put the word ‘vegan’ before everything as it should be obvious that as this is a vegan blog I won’t be referring to, or encouraging the consumption of anything that isn’t vegan. I hope you enjoy the crumble!